Arunachal Pradesh Deputy Chief Minister Chowna Mein on Monday informed that the State Chief Minister Pema Khandu has sought analyses from the Deputy Commissioners regarding the poor performance of the government schools in this year’s CBSE examinations ‘to find out the reasons behind it and for a way-forward solution’. Mein raised serious concerns over the low pass percentage in the CBSE examinations and said that mass awareness is essential in this regard to improve the education system. Attending the inauguration of the new school building of Calvary English School (CES) in the presence of Education Minister Honchun Ngandam at Moinhappa in Papum Pare on Monday, the Deputy Chief Minister urged the teachers not to take their profession casually. Referring to the earlier days when there was 20:80 ratio in the recruitment rules and the schools were manned by outsiders, he opined that the education system was comparatively better then. 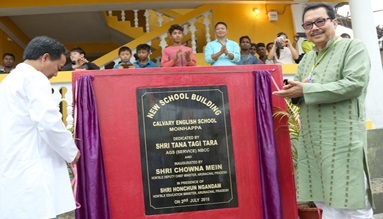 The new school building was constructed with funding from the state government. Chief Minister Pema Khandu had assured to provide the fund when he had attended the school’s silver jubilee celebration in October last year. Addressing the gathering, Mein lauded the Nyishi Baptist Church Council of Arunachal Pradesh for running schools with nominal fees for the students belonging to poor backgrounds. He also lauded the contribution made by the Rama Krishna Mission, the Vivekananda Mission and the Christian missionaries in the education and health sectors in the State. He said the government would extend all possible help to such charitable societies and organizations, irrespective of their religious background. Replying to a memorandum submitted by the school’s principal, Mein assured to look into the request for a multipurpose hall for the school. Ngandam also said the government would support every organization that is working towards educating the State’s children. He said that the government will release grant-in-aid to the Arunachal Baptist Church Council, once the MoU is signed with the ABCC.